Looking back at Soviet Union’s technology, what first comes to mind is the Sputnik, the Soyuz spacecraft, aircraft such as the Tupolev 144 (the famous “Concordski”), or huge nuclear submarines. What does not come to mind are consumer electronics products and computers, which is not surprising. Indeed, after a promising initial period, in the 1950s and 1960s, when under the guidance of pioneers such as Sergey Lebedev USSR developed a number of projects which were innovative also by Western countries’ parameters, technological design in Russia and other countries of the Warsaw Pact apparently collapsed into a passive imitation of the most popular computers, radios, TV and other consumer electronics products manufactured in the Western world, especially in the United States and Germany. 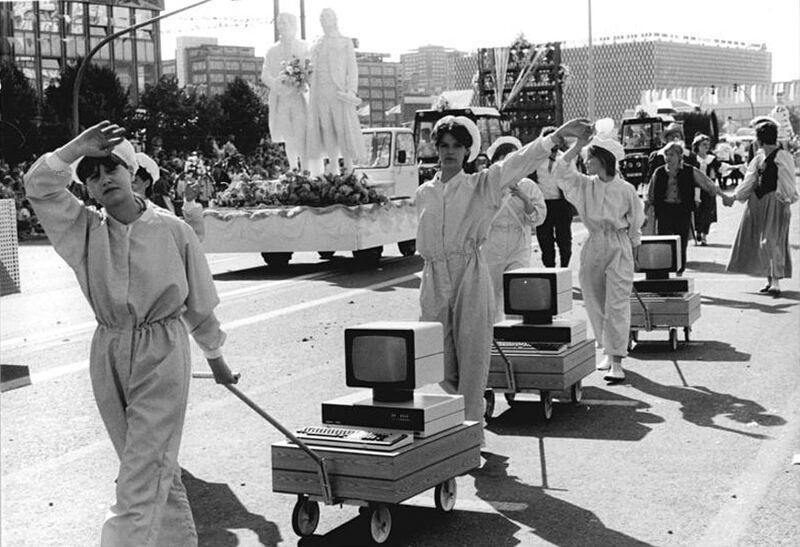 This picture of a parade in Berlin in 1987 shows one of the very few original PCs ever produced in a Socialist State, the VEB Robotron PC 1715 manufactured in East Germany; photo Thomas Uhleman / Bundesarchive. Yet, on this side of the Iron Curtain, it was difficult to be aware of the many innovative ideas and projects under development in Russia since – for political, cultural and linguistic reasons – they didn’t usually come out of the Soviet Empire. Nevertheless, some of those projects, though they’d never become real products also because of the fall of the Soviet Union in the early 1990s, express an inventiveness and creativity that can still teach us something, nowadays. One of them, possibly the most visionary, was named Project SPHINX. It was a futuristic system, conceived in the Eighties by a brilliant Russian designer and engineer, Dmitry Azrikan, at the famous VNIITE Design Institute in Saint Petersburg (the institute, whose name was an acronym for “All-Union Research Institute of Technical Aesthetics”, closed in 2013). 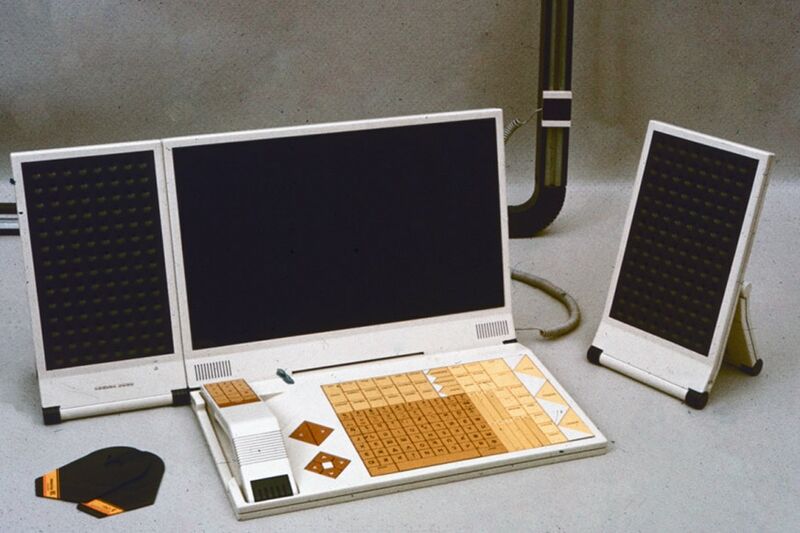 Designed in 1986, SPHINX (again an acronym, this time for “Super Functional Integrated Communication System”) wasn’t just a computer, as it might seem, but a complex system for home automation, digital entertaining, communication, telecommuting, and even telemedicine. The project was commissioned by the State Council For Science and Technology, directly controlled by the Soviet Government, to VNIITE with the intention of creating “a revolutionary computer”. 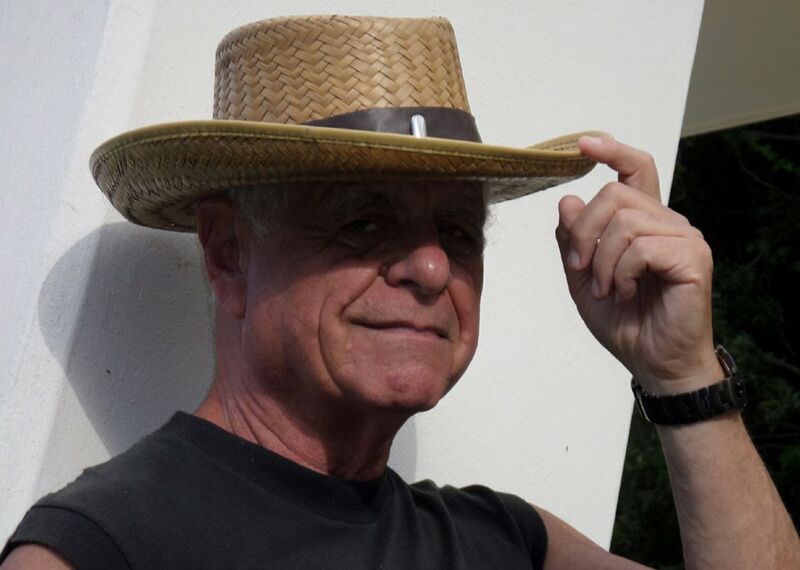 Russian-born Canadian engineer and designer Dmitry Azrikan, the “father” of SPHINX. The core of the system was a modular “memory unit” consisting of a CPU to which three triangular memory expansion modules could be connected. Such configuration was intended to allow different users – each member of a family, for example – to use different programs at the same time, in multitasking. The system was intended to replace all the technological devices in a house, computers, telephone, television, radio, audio system, and so on. To do that, a number of peripherals were included. – A large flat-panel display and TV with two spherical satellite loudspeakers, for home entertainment, and video-conference. 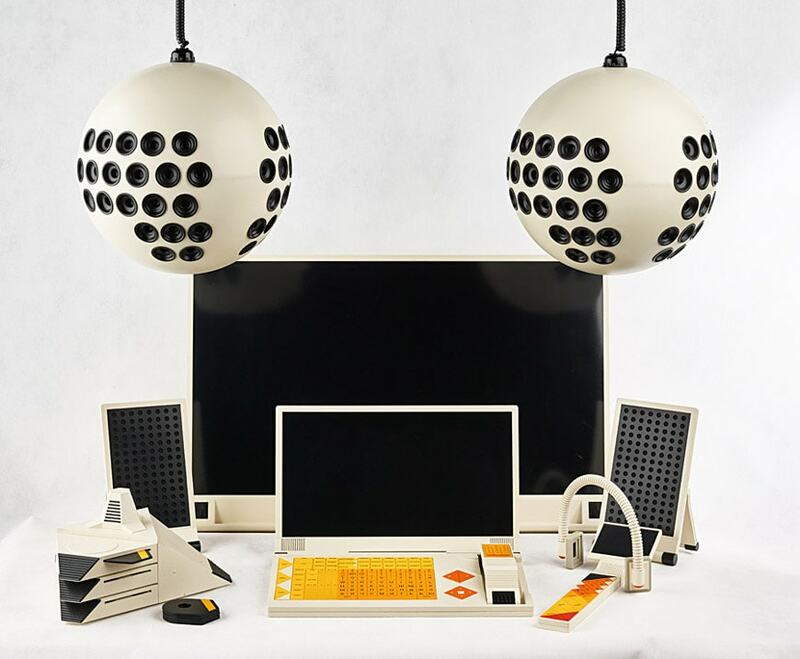 – One (or more) desktop unit – combining a computer and a video and multimedia player – with a keyboard, a 19” 15:9 ratio monitor, two detachable flat loudspeakers, wireless headphones, and an optional telephone. 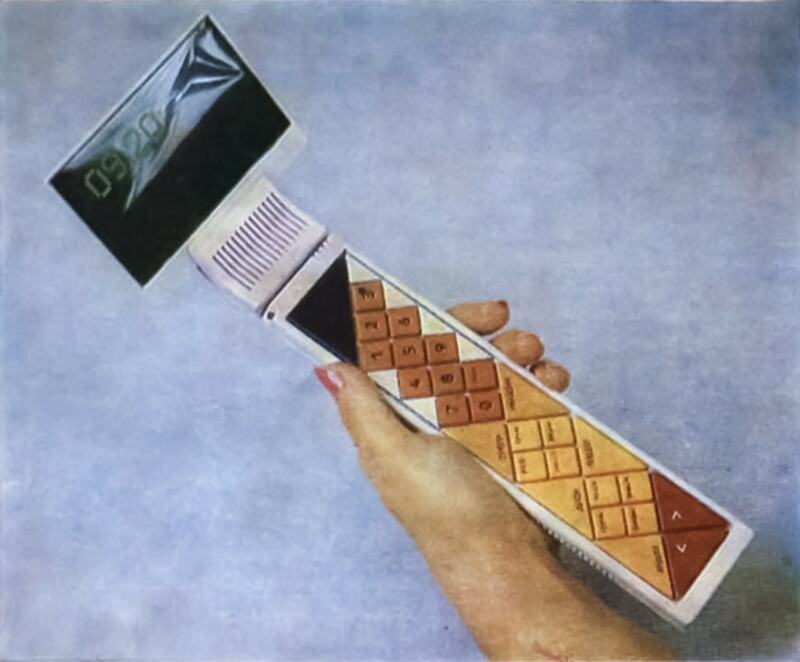 Such a unit did not have a mouse, replaced by a sort of d-pad with four triangular directional buttons. – A handheld remote control with a small LCD screen, a microphone and a speaker which can also be turned into a palm computer. – A number of futuristic wearable devices (never prototyped) including a smartwatch, smartcards, and augmented reality sunglasses. The devices communicated with one another using radio waves, while the system was connected to the rest of the world through the telephone line. 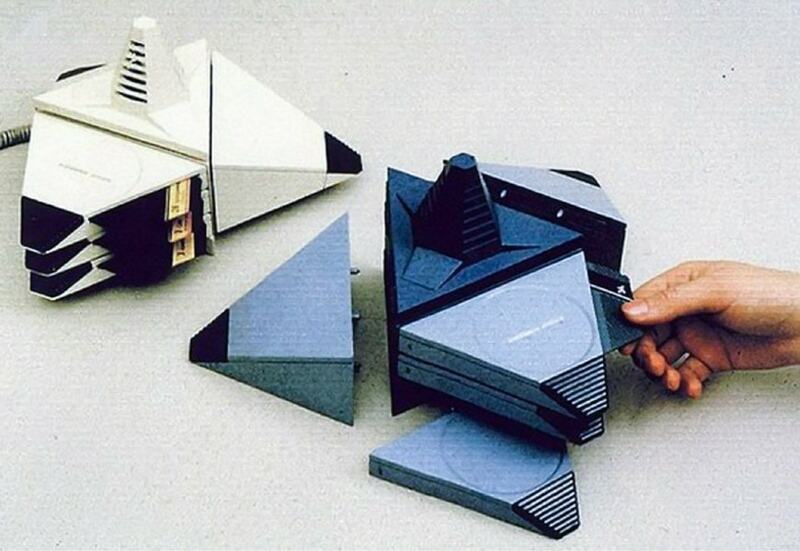 The prototype of the SPHINX system, now on display at the Moscow Design Museum; photo courtesy of MDM. The design of the system was based on simple geometric forms – rectangles, triangles, and spheres – and on a color palette – comprising white, yellow, orange, blue and cyan – devised carefully to clearly identify different functions. Such an uncluttered, minimalist design was typical of VNIITE which, inspired by aerospatial design, prioritized simpleness, lightness, and the removal of unnecessary elements. The plan was to install the SPHINX system in a large number of Russian homes by 2000. Yet, the economic and political downturns of the Soviet Union which culminated in its fall in 1991 (after which Dmitry Azrikan left Russia and moved to Canada, where he still lives) put an end to the project, which remained at a prototype stage and, today, looks like the swan’s song and the silent witness of an era of contradictions and tragedies but also of great expectations and insightful ideas. 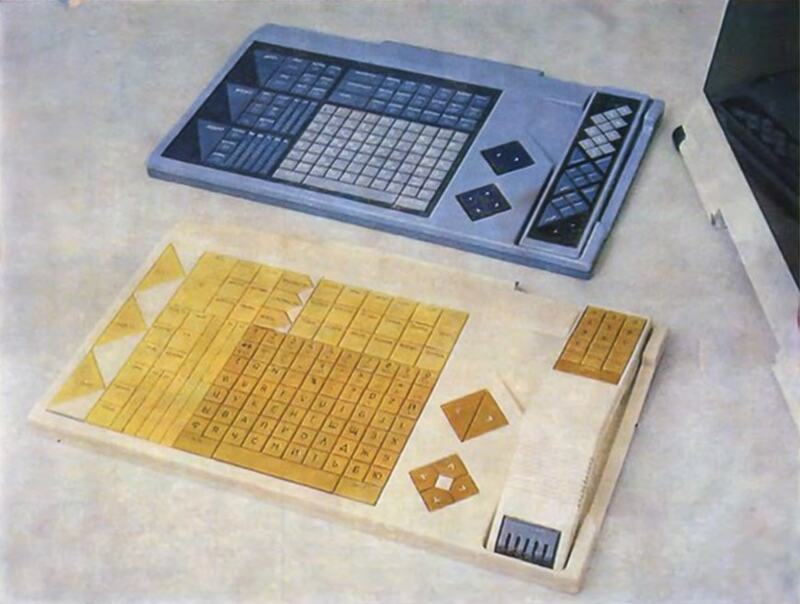 The SPHINX keyboard and handheld remote control, showing the color scheme and geometric design of the system; photo originally published in Technical Aesthetics magazine, 1987.